The World of Minerals & Crystals is a great resource for teachers, mineral club leaders, scouts and museum program directors. 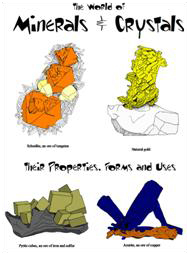 This 40-page resource introduces children to minerals, literally from A to Z, their physical properties, forms and many uses in our everyday lives. The reading/coloring section is followed by a number of fun activities like crossword puzzles, word finds and even a mineral cootie catcher. All the activities reinforce the information from the coloring section. Your purchase of this publication allows you to reproduce up to 250 copies for use in your club meetings, at shows, in your printed newsletters and on your website.